Creating a gestural, anatomical and structural life drawing with Gary Geraths. Glenn Trotter is truly a gifted artist. Beautiful! Here are a couple of videos that caught my attention over the weekend. I love the art doll jewelry by zJayne Altered Art. I always wanted to know what to do with old light bulbs! I finished this abstract painting over the weekend and now it is packaged and ready to be mailed out. It is an acrylic art -mixed media collage on watercolor paper with deckled edges. 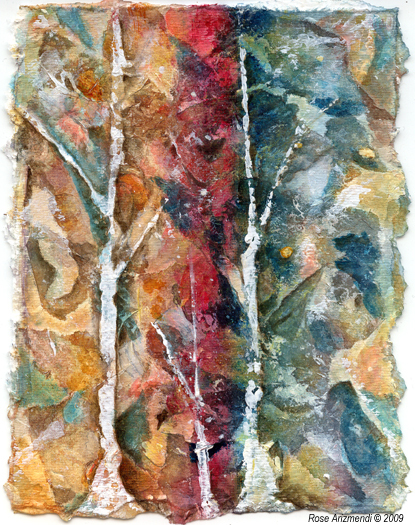 Deep In The Woods – Acrylic Art-Mixed Media Collage – 5 x 7 inches on paper. 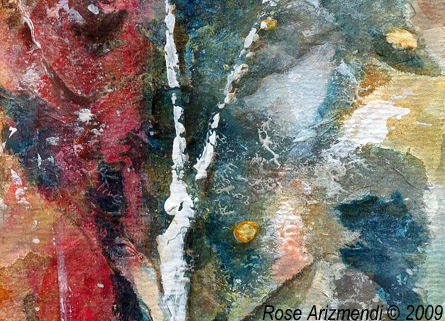 Detail of “Deep in the Woods”. Here it rained all weekend and is still raining. According to the Celtic calendar, March is the second month of Spring, and for us it seems it has started out as a wet blustery month. The wind was blowing strong last night and this morning we found that there were dead branches and leaves strewn all over our yard. It was as if Mother Nature decided to sweep and clean out the old to make way for the new. I love Spring with all the daffodils bursting from the soil, with their vibrant yellow heads stretching towards the sun and the cherry tree blossoms floating through the air. For me, this time of the year is like a living breathing poem.